Color is a great way of bringing condition and body to the hair, Even if you are happy with your natural color, a rinse in the same tone can bring extra gloss and shine Derived from vegetable extracts, shine on colours are excellent for rehydrating dry hair and bringing that extra life back to hair that has already been dyed but has lost its original sheen. On fine hair, the color can plump up the hair shaft and add much-needed volume. To provide maximum depth to flat hair, two colors are used, one on the top section and one underneath. It is very important to remember that even some of the gentlest of chemical treatments can dehydrate the hair, therefore it might need a little more TLC than normal. Choose a shampoo, conditioner and Styling products that are designed to help maintain your color and reduce any discoloration or fading. It’s always an important decision to choose the right color so a hair color chart with real images can be a great help when choosing your new look. 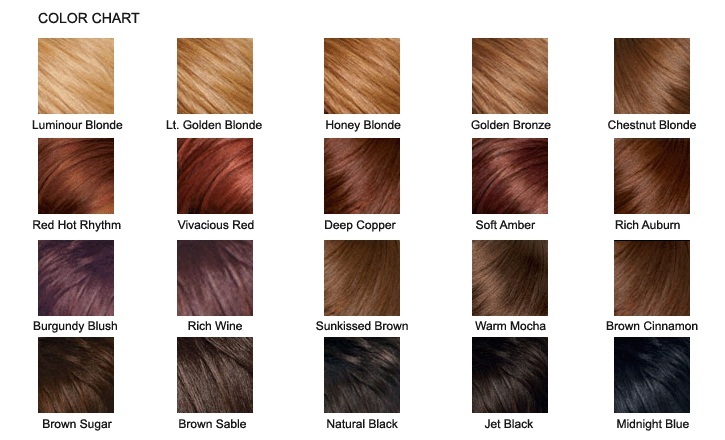 A Hair Color Chart to help you choose your new look.